Those who are familiar with North Fort Worth know that even though the area is rapidly booming with homes and new populations, there are certain places that need to be improved. One of these locations is North Tarrant Parkway, an important road that runs East-West and connects vital parts of Keller and North Richland Hills. This road has held multiple accidents throughout recent years, some holding serious injuries. This is the case, as will be discussed below, of homeowners who have had their brick wall replaced not once, not twice, but five times after vehicles have crashed into it. According to public officials, the road between the 800 and 1100 blocks of North Tarrant Parkway have held over ten serious accidents within the last decade. One of the most influential factors of these crashes has been linked to the road’s slippery surface after it has rained. The most recent accident occurred November 8th, where a car lost control and ran into a barrier placed by city workers to prevent cars from hitting the brick wall or nearby tree. The homeowners of the house with the constantly damaged brick wall have noted that the wall has had to be fixed five times and costs from $5,000 to a little over $10,000. The proposed solution includes reducing the road’s speed limit to 35 miles per hour and carving grooves on the road’s surface to improve traction. The proposed roadwork would cost a little over $23,000. Additionally, the city would install digital signs to inform drivers what at what speed they are travelling, and a sign notifying drivers that when wet, the road becomes slippery. These safety improvements need to be approved by the Keller City Council before it comes into effect. 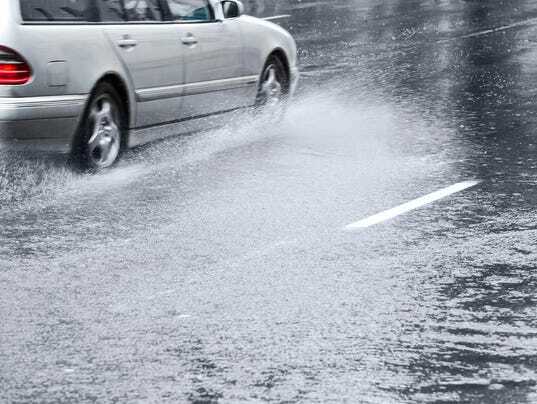 How Can I Drive Safe During the Rain? Driving during the rain is something that all drivers must face. For those who are cautious and stay alert at all times, this would be a relatively painless task. However, for those who choose to drive recklessly and with distractions, this may be something to improve on. Driving while it’s raining or the roads are in a wet condition due to other factors, such as snow, ice, etc., requires focus and readiness. Let’s briefly talk about why both are equally important. First, a driver needs to be focused in order to avoid being in an accident. This includes putting their phone down, making sure their headlights are on if it’s dark, braking on time, and so on. This preventive form of driving can provide safety to the driver, passengers, and other vehicles on the road. Second, a driver needs to be prepared and ready should anything happen. While drivers might do everything they can to drive safely, the reality is that other drivers might not be as safe. For this reason, drivers must be prepared to maneuver their vehicles in a way that is both quick yet safe. Notice the yet in the previous sentence. Some drivers might be quick to make a quick maneuver but place themselves in a near or worse danger, such as swerving onto the next lane with oncoming traffic or driving off the road. Last-second maneuvers must be done in a manner that places oneself in safety without placing another immediate danger in the way.